There are many ways to get to Great Falls | Montana’s Basecamp for Art & Adventure. 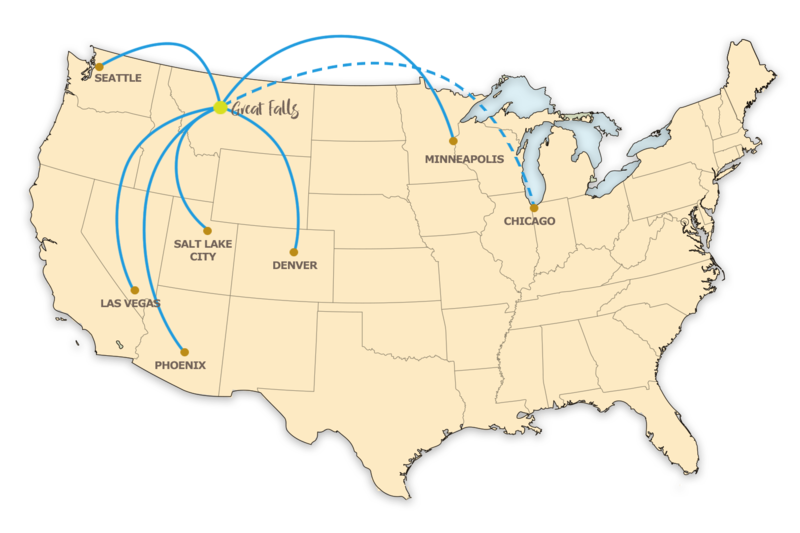 Great Falls boasts the lowest average airfares in Montana. 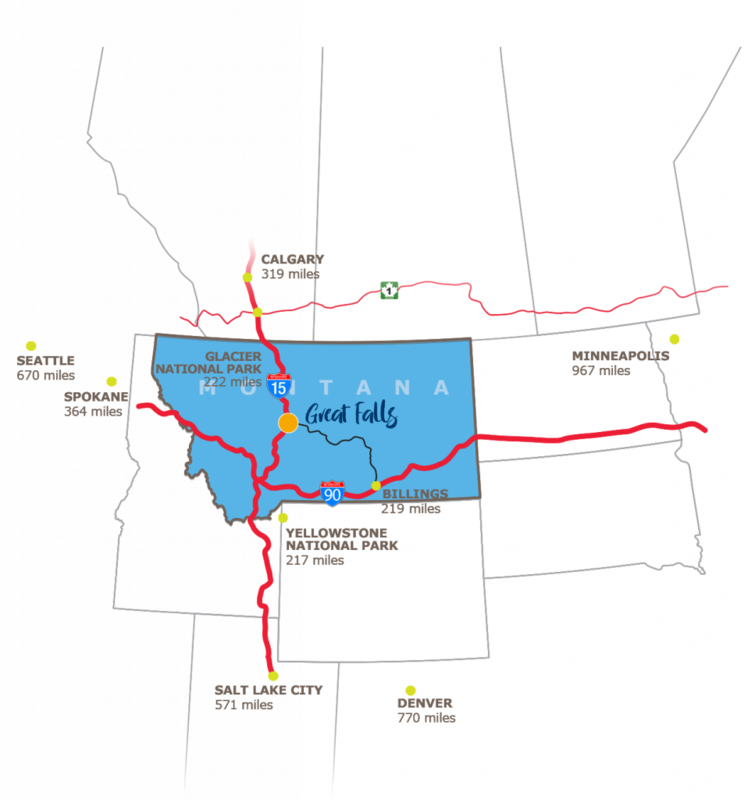 Located at the intersection of Interstate Highway 15 and MT State Highway 200, Great Falls is located in Central Montana between Yellowstone and Glacier National Park. Salt Lake Express | 326 1st Avenue S | 208-656-8824 | Salt Lake Express is a shuttle service company popular along I-15 that picks up and drops off passengers at the Great Falls Transit District building who are traveling in and out of Great Falls. Greyhound | 326 1st Avenue S | 406-453-5261 | Greyhoud is a National bus service company that transports between Montana cities and across the Nation. Passengers will arrive and depart from the Great Falls Transit District building in downtown Great Falls. Golden Triangle Transit | 226 1st St S Shelby, MT | 406-470-0727 or 406-873-2207 | Golden Triangle Transit provides transfers to Great Falls. Reservations are required and can be made by calling 406-470-0727 by 4 pm the day before you plan to travel. Montana Adventure Shuttle | 406-493-2345 | Montana Adventure Shuttle offers transportation for statewide travel needs. Seating up to 11 passengers, Montana Adventure Shuttle offers clean, safe, and comfortable rides year-round. Amtrak | 230 West Central Ave Shelby, MT | 800-872-7245 | Amtrak runs along the Montana Highline along Highway 2 less than an hour and a half from Great Falls. Blacked Out 406 | 232 22nd Avenue NW | 406-781-5218 | Blacked Out 406 is a Great Falls-based transportation service that includes taxis and limos. Montana Adventure Shuttle | 406-493-2345 | email | Montana Adventure Shuttle provides group shuttling, adventure, tours, and more throughout Montana. Montana Adventure Shuttle is where adventure stories begin! Uber and Lyft are available throughout Montana are can provide transportation around Great Falls and to other regional locations.